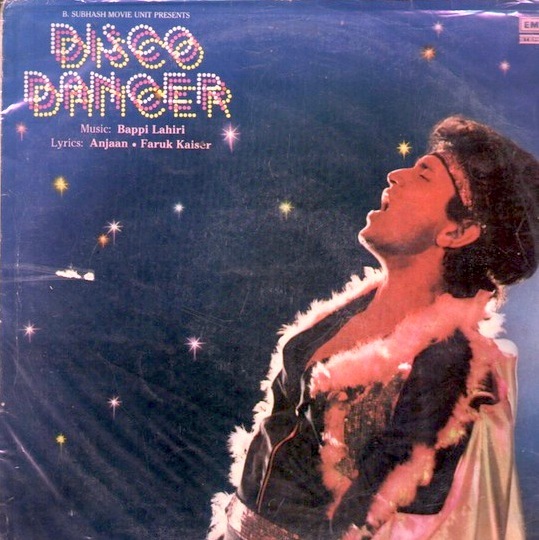 The first song in this series steals a few of its best tricks from the Buggles’ “Video Killed the Radio Star” and appears on the soundtrack of the 1982 Bollywood smash hit Disco Dancer (watch the whole fabulous thing on YouTube). Though sung by Usha Uthup (also responsible for this fantastic cover of Michael Jackson’s “Don’t Stop ‘Til You Get Enough“) and Bappi Lahiri, it was of course not performed by them in the film. Instead, the film stars Mithun Chakraborty (by 1986 India’s highest tax payer and basically India’s John Travolta, one imagines, though he was also popular in surprisingly disco-friendly Soviet Russia) as Anil, a street performer who rises from his lowly origins to win first place in an international disco dancing competition. His is not a traditional ‘dance movie‘ story though, as an important part of the film’s plot is his close relationship to his mother, who supports him even through lines like, “Mother, I have my music. I will sharpen this music like a sword and stab the city’s heart with it.” When a malicious promoter sabotages Anil’s guitar in an attempt to kill him with 5.000 volts of electricity (Danger! Danger! High Voltage! ), it is she who rushes to the stage and picks up the axe in sacrifice, leading poor Anil, by this time rebaptized as Jimmy, to develop severe guitar phobia. “Auva Auva…” is not the only great song on the soundtrack, though, as there’s some fantastic proto-techno ragas, finger-snapping kung fu, and the fantastic “Jimmy Jimmy Jimmy Aaja” (sung by Parvati Khan), which was made exponentially more famous outside the Hindi-speaking world through M.I.A.’s cover in 2007 (and was in turn covered by Of Montreal). “Jimmy”, as I’m sure won’t surprise you, is not really an original either, as it’s quite strongly based on the French disco track “T’es OK” (actually selling more copies than “Video Killed the Radio Star” in France , you’ll be interested to learn) by Ottawan, a band we all remember fondly for their insta-classic spelling bee “D.I.S.C.O.”, which of course was produced by Daniel Vangarde, father to Daft Punk’s Thomas Bangalter and no stranger to da funk himself.